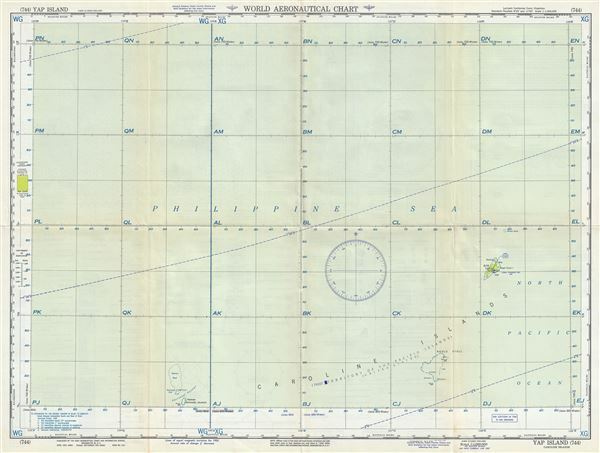 This is a scarce 1957 U.S. Air Force aeronautical chart or map of Yap or Wa'ab Island, part of the Caroline Islands in the Western Pacific Ocean. It covers the four islands of Yap as well as the surrounding waters. The chart identifies the Velasco Reef, the Ngaruangl Reef and Island, Kayangel Islands, Ngulu Atoll and the Trust Territory of the Pacific Islands (United States). Verso of this chart features legends and a world aeronautical chart index. This chart was published by the USAF Aeronautical Chart and Information Service, Washington 25, D.C., and was issued as chart no. 744. First issued in 1942, this is the fourth edition revised to Jan. 1957. Very good. Minor wear and toning along original fold lines. Minor worm holes along centerfold.